This limited edition print depicts the men of Company E as they made their iconic approach onto Omaha Beach in the early morning of June 6. 150,000 men. 50 miles of coastline. One iconic scene that captures it all. Yes! I’d like to buy this limited edition print today! Sometimes the numbers are too staggering to comprehend. …But a picture can say it all. D-Day: The Soldier’s View is a limited edition print you’ll only find here at Warfare History Network. It depicts the men of Company E as they made their iconic approach onto Omaha Beach in the early morning of June 6. But what’s really happening here? How did the smoky sky above contribute to the landing? What did these men experience as they hit the water? …As you’ll find out, this special print reveals more about the events surrounding the Normandy invasion than any flowery description or Hollywood portrayal. As with the rest of history’s paramount undertakings, context is important when understanding the events at Normandy. Omaha Beach was a five-mile stretch of coastline that was vital to a successful Allied invasion. Commanders deployed over 43,000 men whose main objective was to link the Americans to the west at Utah Beach with the British, who would take hold of Gold Beach to the east. The plan called for a series of landings to deploy in concert with naval and air force operations. Allied command put their infantry, naval captains, airborne soldiers and armored unites into extensive training and simulations to prepare them for the operation. And almost nothing went as planned. D-Day’s “H-Hour” was slated for 0630 that morning. This photo was taken at 0645, fifteen minutes into what would become the largest sea invasion in human history. In the end, there would be over 10,000 casualties. Omaha Beach was divided into ten sections, each given its own codename. Easy Red was at the eastern end of Omaha, along with Fox Green. The men you see in the print were part of Company E of the 116th. Along with Company F, they were to land on Easy Green during the first wave of the D-Day invasions. Their experiences were tumultuous at best. There was a slight mist that morning, as you can see above the picture’s horizon line. But by this time, there was also a great deal of smoke and beach dust kicked up from the barrage of naval fire behind them. These conditions made it nearly impossible for the LCVP captains to recognize the landmarks they trained so hard to memorize. …And of course, there was also the problem of the tides. Low tide on June 6 was at 0525. By 0645, the rising tide came with a powerful lateral current that swept across the Omaha Beach landing sites. Strong winds only exacerbated the problem; just five miles offshore, the current was at just under three knots. As a result, the men of Company E drifted almost a full mile eastward of their objective. But the problems didn’t end there. As you can see in the print, the waters were running fairly high for the men who waded ashore. While fighting the tidal surf and cross-current, they were forced to discard most of their weapons just to make it on-shore. Mortars, flamethrowers, infantry equipment—all lost. Two boats made it to a landing site without incident; four more took heavy fire like most of the rest. Only a handful of assault infantry were able to land during the first wave; in the first thirty minutes, the only Allied forces found on Easy Red were about 100 men and three functional amphibious Duplex Drive (DD) tanks. Andrew Higgins … is the man who won the war for us. … If Higgins had not designed and built those LCVPs, we never could have landed over an open beach. The whole strategy of the war would have been different. What you see depicted in the print’s foreground is one of the great icons of the Normandy landings—the LCVP or “Higgins Boat.” Constructed out of plywood, they ferried the men onto Omaha Beach one platoon at a time. …But as anyone will tell you, riding in one of these things was no pleasure cruise. From the start, the LCVPs were getting drenched with sea spray. Most took in so much water that their pumps were on full use by the time the men hit the shore. This caused the boats to take on extra load from the water; something they weren’t well-equipped to do. Those taking in more than they could handle started to straggle behind the rest. However, attempts by some captains to compensate by increasing their speed only brought in more water. Some soldiers resorted to bailing the boats out using their helmets. Drenched from the constant sea spray and forced into such cramped positions, many men became overcome with sea sickness while they landed. 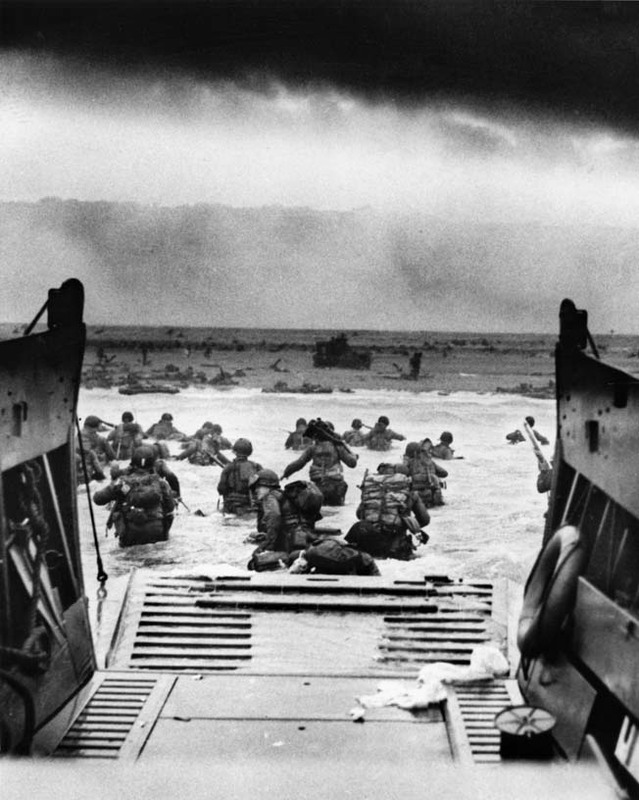 Perhaps by force of will alone, the men of Company E were able to take their objective on D-Day. But for months afterwards, those who survived remained in a daze from the events they lived through. It was, truly, one of history’s most defining moments. And now, you can own a permanent memento that commemorates their courage. Printed on 12″x18″ silver emulsion photographic paper, this high-quality poster is the perfect addition to any history buff’s home or office. Reserve your limited edition print today!